India was the first nation to ratify the Treaty on June 24, 2014 at the twenty-eighth session of the Standing Committee on the Copyright and Related Rights Act, 2000 in Geneva. On September 30, 2016 the Treaty came into force by formally gathering 20 nations that acceeded the Treaty.5 Hopefully the number of members joining the Treaty will increase in the coming years. 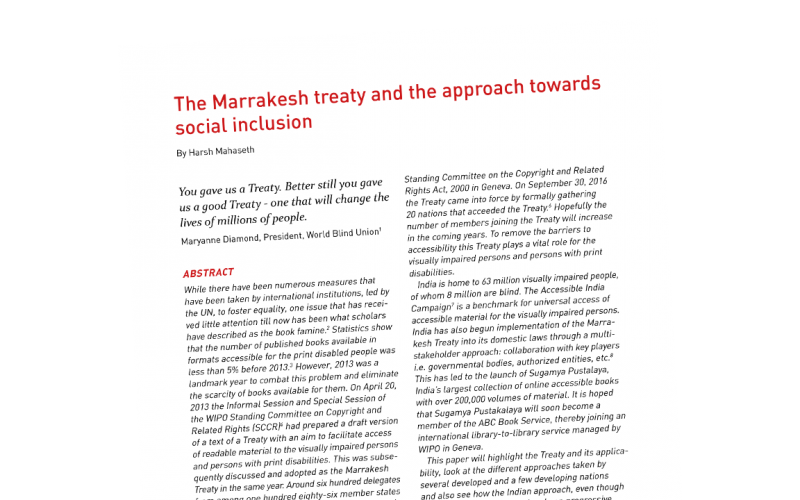 To remove the barriers to accessibility this Treaty plays a vital role for the visually impaired persons and persons with print disabilities. India is home to 63 million visually impaired people, of whom 8 million are blind. The Accessible India Campaign6 is a benchmark for universal access of accessible material for the visually impaired persons. India has also begun implementation of the Marrakesh Treaty into its domestic laws through a multi- stakeholder approach: collaboration with key players i.e. governmental bodies, authorized entities, etc.7 This has led to the launch of Sugamya Pustalaya, India’s largest collection of online accessible books with over 200,000 volumes of material. It is hoped that Sugamya Pustakalaya will soon become a member of the ABC Book Service, thereby joining an international library-to-library service managed by WIPO in Geneva. This paper will highlight the Treaty and its applicability, look at the different approaches taken by several developed and a few developing nations and also see how the Indian approach, even though being a developing nation, has been progressive and beneficial to the beneficiaries of the Treaty and should be seen as an inspiration for the other nations. Francis Gurry, Making Books Accessible to all, The Hindu, November 01, 2016, Available at http://www.thehindu.com/opinion/op-ed/Making-books-accessible-to-all/article15005883 ece.